The global orthopedic orthotics market was valued approximately at US$ 3.4 Bn in 2017 and is projected to expand at a cumulative annual growth rate (CAGR) of over 5.5% from 2018 to 2026, according to a new report published by Transparency Market Research (TMR) titled ‘Orthopedic Orthotics Market Global Industry Analysis, Size, Share, Growth, Trends, and Forecast, 2018–2026.’ The report suggests that an increase in the number of bone injuries enhancement in technology, and rise in awareness about health care is expected to propel the orthopedic orthotics market in the coming years. In addition, increase in concerns about diabetes and obesity related diseases is anticipated to drive the global market. North America and Europe are projected to dominate the global market, owing to an increase in demand for efficient and effective management of orthotics after orthopedic or spine surgery and high adoption of orthopedic orthotics by doctors during treatment. The market in Asia Pacific is projected to expand at a prominent CAGR between 2018 and 2026. This is due to increased spending on public health care systems, rise in the production of traditional and advanced orthotic products, rise in the geriatric population that requires physiotherapy services after bone surgery, and increase in adoption of sports activities among the younger generation. The orthopedic orthotics market in Latin America is likely to expand at a moderate growth rate during the forecast period. The global orthopedic orthotics market is projected to be driven by the rise in number of orthopedic surgeries and use of different material for making an orthotic systems in order to streamline the day to day work flow by the disable patients. Orthopedic orthotic devices provide a number of features and benefits such as patient pain heeling remedies which can be practiced by physicians and hospital staff for the different disable patients. These features help physicians and nurses streamline the physiotherapy activity required for patients to maintain their daily workflow efficiently and effectively. Key players offering orthopedic orthotics are coming up with value added features such as effective probes, sensors, microprocessor, and effective modality features. These features help reduce the overall operating costs and improve the effectiveness and efficiency of physiotherapy practices. Companies are focusing on the development of mechatronic solutions for the auto adaptive control of prosthetic and orthotics components. Electronic intelligence integrated products manufactures by the companies are adapted for different conditions of disability. These value added features save the operational time of physicians and help improve pain management performance. Traditionally, drugs and therapeutics-based treatments were most commonly used in the pain management therapy for orthopedic surgery or injury. Presently, lower-limb orthotics were regularly used by athletes to prevent serious injuries during sports activity. Technology-based orthopedic orthotics are priced on a perpetual license model and are less expensive compare to other orthopedic surgeries. Lower-limb orthotics enable users to practice low frequency clinical applications, allow healing of extreme pain in musculoskeletal structures, and provide assurance of 90% recovery by physicians. These factors are likely to propel the lower-limb orthotics segment during the forecast period. Lower-limb orthotics address specific requirements that arise during the treatment procedure. They are preferred due to their low cost and high tensile strength. Furthermore, lower-limb orthotics based on technology facilitate pain relief and increase the range of motion and muscular strength among patients who have bone injury. The report offers detailed segmentation of the applications of orthopedic orthotics for neuromuscular and musculoskeletal disorders, fractures, sports injuries, and others. The neuromuscular and musculoskeletal disorders and others segment is anticipated to account for a leading share of the market during the forecast period. Factors attributed to the higher share of the neuromuscular and musculoskeletal disorders and others segment include rise in the incidence of orthopedic surgeries; increase in the prevalence of spondylitis, scoliosis, and arthritis among the global population; and rise in demand for minimally invasive orthopedic surgeries from physicians and patients. Reimbursement and Medicare benefits available to patients for the treatment of neuromuscular and musculoskeletal disorders have contributed to the key share of the neuromuscular and musculoskeletal disorders segment. In terms of distribution channel, the hospitals pharmacies segment accounted for a leading share of the global orthopedic orthotics market. The market share of the segment is estimated to increase by the end of 2026. The segment is anticipated to expand at a CAGR of more than 5% during the forecast period. Rise in the availability of specialized pain management services, increase in the footfall of orthopedic patients in hospitals, and adoption of digital platforms for the marketing of the pain management practices have led to the prominent share of the hospitals segment in the global orthopedic orthotics market. Increase in the number of multinational hospital chains and high digitization budgets are likely to drive the expansion of the hospitals pharmacies segment during the forecast period. High prevalence and incidence rates of bone injuries and arthritis and increase in the number of cases of hip fractures and diabetic foot sores among the global population have resulted in an increase in patient flow to clinics. These factors are expected to fuel the online pharmacies segment between 2018 and 2026. 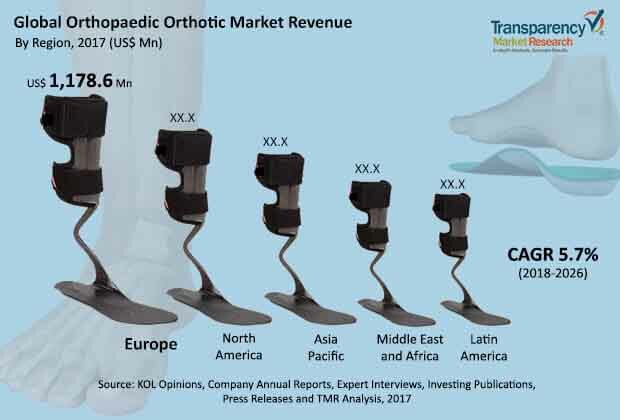 North America and Europe accounted for a key share of the global orthopedic orthotics market in 2017 and are likely to gain market share by the end of 2026. High adoption of digital platforms for pain management, high spending on health care, and government initiatives to promote minimal invasive surgery techniques have contributed to the leading share of these regions in the global orthopedic orthotics market. Asia Pacific is projected to be a highly attractive region of the orthopedic orthotics market, with a high attractiveness index. The market in Asia Pacific is projected to expand at a high CAGR of over 6% during the forecast period due to presence of a large number of online pharmacies in emerging countries such as India and China; well-established health care facilities; and high adoption of orthotics in countries such as Japan, Australia & New Zealand, Malaysia, Singapore, etc.. The market in Latin America is expected to expand at a moderate pace during the forecast period. The report also provides profiles of leading players operating in global orthopedic orthotics market. DJO Global, Inc., Ossur Corporate, and Ottobock SE & Co. KGaA (Ottobock Holding) are some of the leading players operating in the global orthopedic orthotics market. They account for a significant market share. Companies operating in the orthopedic orthotics industry are aiming to increase their geographic presence by means of strategic acquisitions and collaborations with leading players in their respective domains and geographies. In 2017, Ossur Corporate introduced more than 40 new product solutions in the market. Ossur Corporate focused on non-surgical treatment options for improving lumbar spine pain function using bracing. In November 2017, the company introduced Miami LSO, which improved function and decreased pain in patients with lumbar spinal stenosis (LSS). Other prominent players operating in the global orthopedic orthotics include Fillauer LLC, Basko Healthcare, Bauerfeind AG, Breg, Inc., BSN medical, and DeRoyal Industries, Inc..